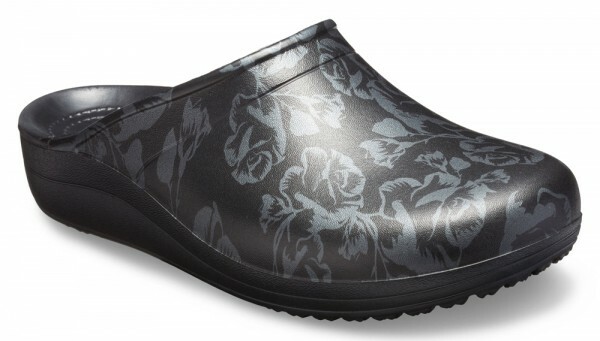 Product information "Sloane Graphic Clog Metallic Rose / Black Croslite"
Inspired by our popular and amazingly comfortable Crocs Sloane flips, we couldnt wait to introduce this clog version. Fabulously feminine, sensibly straight forward in design, with just the right amount of lift and a stable heel-like experience that never sacrifices the Iconic Crocs Comfort youve come to depend on. Sometimes spoiling yourself is just that simple! Related links to "Sloane Graphic Clog Metallic Rose / Black Croslite"
Customer evaluation for "Sloane Graphic Clog Metallic Rose / Black Croslite"